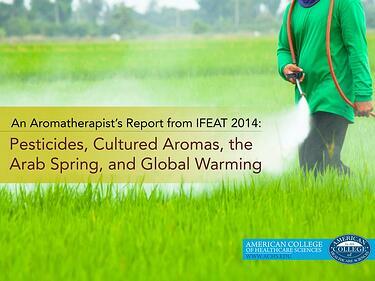 What do pesticides, cultured aromas, the Arab Spring, and global warming have in common? You may not initially think of these major global issues as connected, but their impact can be felt across the entire Aromatherapy industry and they should be a current concern for Aromatherapy professionals. In late September 2014, while the American Aromatherapy industry was in turmoil over the not-so-surprising FDA warning letters to Young Living and doTERRA (the two leading multi-level marketing Aromatherapy companies in the U.S.), scientists and essential oil producers were sharing their concerns for our common commodity—those precious raw materials, essential oils—at the annual International Federation of Essential Oil and Aroma Trades (IFEAT) Conference in Rome. While IFEAT is a wonderful resource for cutting-edge issues in the essential oil flavor and fragrance sectors, it is primarily one huge trading floor. Not quite like the buy-and-sell din of the Wall Street stock exchange—the trading floor, in this case, was a luxury 5-star hilltop hotel in Rome—it is still the one event where major and minor raw material sales are carried out on a yearly basis. Buyers and purchasers, the organized ones with pre-arranged appointments, hover in set meeting areas searching the crowd for faces they have only met via the Internet, while the “old-timers” spend time double-cheek kissing, hand shaking, and warmly embracing. It is a huge event, and more than 1,000 members attended this year. a broader perspective of the issues facing not only our industry, but also the earth and the people who produce the raw materials of the Aromatherapy profession. Of all the information shared at IFEAT 2014, four specific concerns surrounding our Aromatherapy raw materials struck me as urgent. After all, where would we be without our raw material? Pesticide residue and concern for pesticide levels in essential oils, even in certified organic oils, was the subject of three sessions at IFEAT 2014. It was fitting that Dr. Jasmin Peschke, head of Weleda Quality Management in the Fragrance Competence Center, kicked off this segment of sessions with a presentation called “Pesticide residues in essential oils—Current findings.” Weleda is a stalwart of quality health and wellness products with more than 90 years’ commitment to organic. Dr. Peschke’s presentation revealed how concerned Weleda, a major manufacturer with significant market share in the organic sector, is with pesticide residues. even more likely if pesticides are administered during cultivation of the plant material. However, passive contamination can also occur even if a farmer does not actively use pesticides. Acts of nature such as a puff of wind or water runoff from a neighboring field, even incorrect storage of an essential oil, can all result in cross contamination, according to Dr. Peschke. We know that distillation and cold pressing both influence the transition of pesticides into essential oil. However, Dr. Peschke emphasized that according to the test results conducted by the German Medicines Manufacturers’ Association (BAH) Working Group on Contaminants, cold-pressed essential oils from the pericarp of citrus fruits are more likely to contain pesticide residues than steam-distilled citrus because of the hydrophilic, thermostable, and volatile characteristics of pesticides. An unfortunate fact considering cold-pressed citrus essential oil, not steam distilled, is the desired product for Aromatherapy and perfumery. two important results: the formation of a European Pharmacopoeia expert group on pesticide residues in essential oils and conversation to determine whether or not regulation is needed. According to Dr. Peschke, to assess pesticide residue risk, the European Pharmacopoeia expert group uses the same procedures used in herbal medicine products. She also recommends this same method if you find them in your essential oils. The first step is to check the European Pharmacopoeia list to see if the specific pesticide is listed, and then check the maximum residue levels. This of course depends on your own quality-control values. For example, would you accept an essential oil, organic or not, with any level of pesticide residue? A review of the European Commission’s online database reveals some botanicals, such as chamomile (listed under “Camomille flowers”), have a 12-page long list of acceptable pesticides and the maximum residual levels (MRL). If the pesticide is not on the list, it is possible to use a similar list published by the European Union that catalogues the maximum risk levels of pesticides in food. To calculate the risk, use a formula of the acceptable daily intake of the pesticide, the maximum daily dose of product, and divide by the body mass of the consumer. Note, however, that this is for herbal medicine products—not essential oils. From 2006 to 2013, the European Pharmacopoeia expert group database has specifically focused on essential oils. To date, approximately 589 samples have been tested representing 28 different essential oils, and each sample is tested for approximately 217 substances. The good news is that 314 samples have shown no residues at all—that is 53% of all samples. However, 275 samples revealed at least one positive result, and 1,150 results were contaminated with more than one pesticide. The 65 samples of Neroli oil revealed 199 positive pesticide findings, and 77 results showed the pesticides, such as biphenyl and chlorpyrifos-ethyl, were above the maximum levels. Additionally, Dr. Peschke’s presentation noted that 49 samples of Rosemary oil were tested, and 15 revealed more than the maximum level of biphenyl. Since biphenyl is usually a citrus peel treatment agent, and Rosemary does not have a peel, Dr. Peschke asked, “How could this oil become contaminated?” The packaging and the manufacturing equipment are two possible causes. Dr. Peschke noted that further oils tested included Eucalyptus, Caraway, and Lavender. Of 36 Eucalyptus samples tested, three were positive for pesticides. Of 25 Caraway samples tested, three were positive for pesticides. And of 19 Lavender samples tested, one was positive, but none were above the MRL. It is important to note that, as mentioned above, pesticide residue in cold-pressed oils is even more prevalent than steam-distilled oils. Most pesticides can easily combine with or dissolve in lipids or fats, facilitating the transition to the oil. Generally, all samples discussed in Dr. Peschke’s research revealed a wider range of pesticides, and more were above the MRL compared to distilled oils. Following this information, Dr. Peschke proposed a number of questions, conclusions, and action items. For example: Is it reasonable to apply a risk-based approach in routine quality control? Are pesticide limits for essential oils required? Dr. Peschke says no—regulations can be similar to herb-drug regulations. And, moving forward, do tests need to differentiate between conventionally grown and organic essential oils? Dr. Peschke says yes. The European Pharmacopoeia database continues to be evaluated at regular intervals and is a useful resource for providing a representative overview of the current situation regarding pesticide contamination of essential oils. However, the European Pharmacopoeia expert group on pesticide residues in essential oils remains undecided as to whether or not regulation is needed. Peschke J. (2014, September 23). Pesticide residues in essential oils– current findings. Lecture at the International Federation of Essential Oil and Aroma Trades (IFEAT) Conference 2014, Rome, Italy.